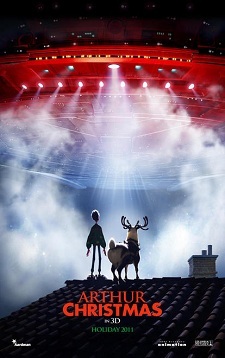 Set on Christmas night, the story of Arthur Christmas at last reveals the incredible, never-before seen answer to every child’s question: ‘So how does Santa deliver all those presents in one night?’ The answer: Santa’s exhilarating, ultra-high-tech operation hidden beneath the North Pole. 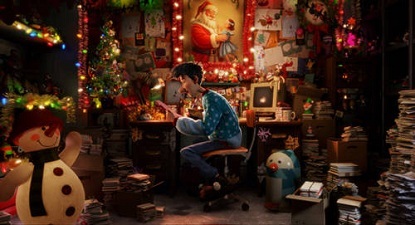 But at the heart of the film is a story with the ingredients of a Christmas classic – a family in a state of comic dysfunction and an unlikely hero, Arthur, with an urgent mission that must be completed before Christmas morning dawns. Aardman/Sony’s new CGI feature has gift of a voice cast: James McAvoy leads as Arthur, the good-natured but clumsy younger son of Santa. Arthur loves everything to do with Christmas; indeed, he is the only one in his family still captivated by the magic of the holiday. Hugh Laurie plays Arthur’s older brother Steve, heir to the reins, a cool, incredibly capable guy who has given the North Pole high-tech efficiency, military-style precision. Jim Broadbent is Santa, who pictures himself as the guy in charge at the North Pole, but is now more of a figurehead as the operation has outgrown him. 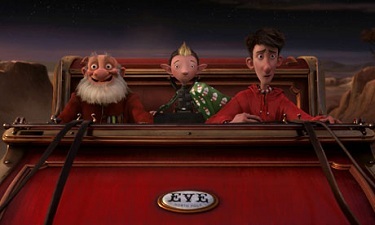 Santa’s 136-year-old father, Grandsanta, is voiced by Bill Nighy as a cranky old codger who hates the modern world, is always grumbling that Christmas ‘was better when I was Santa’ and has a tense relationship with Steve, who he calls ‘A postman with a spaceship.’ Ashley Jensen is Bryony, a lowly elf from the Giftwrap Battalion, with an eager-to-please attitude and an obsession with wrapping and bows, and Imelda Staunton rounds out the cast as Mrs. Santa, dedicated wife and mother to her husband and sons. 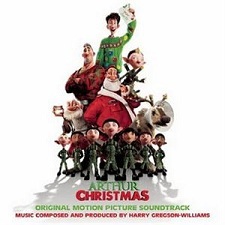 For this delightful movie, the creators had the great taste to reach out to one of the finest composers of the present film scoring scene, Harry Gregson-Williams: a true Christmas gift for any music buff! 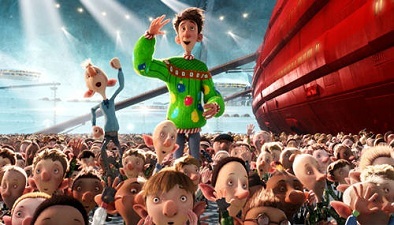 Animated Views: How did the project Arthur Christmas start for you? 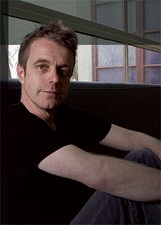 Harry Gregson-Williams: Well, I was brought in quite late, actually, on the project. The company had a different idea of a composer – not me. He had started to work on the film but it didn’t really work out between them. So, I was brought in and had a very limited amount of time to do it. Between four and five weeks, which is very abnormal for an animated film, or any film. But it was such a wonderful project. It had all the ingredients that I look for in a project: action-adventure, with a great emotional charge to it. And, on top of that, as a bonus to me, it was very English – I loved that about it! And it’s a Christmas film, and I haven’t done one before. AV: I understand you’ve already worked with Aardman before. HGW: I do have a relationship with Aardman, notably with the Producer Carla Shelley. I did Chicken Run with John Powell many years ago, and Flushed Away, which wasn’t very successful at the box office. But it was a good fun to do that. That said, one of the differences between this score and Flushed Away is that Flushed Away had various kind of random needle-drop songs in it and it was one of those movies where the score didn’t really have a chance to get going and take hold in the movie. With Arthur Christmas, we did a song with Bill Nighy at the very end of the credits, but apart from that, it’s all score and the score had every chance to make a successful contribution to the world we find ourselves in. AV: There’s plenty of Christmas movies every year. How did you find your own way? HGW: In terms of being a part of a Christmas tradition, I had never done it before, so it was extremely fresh to me. I also loved the fact that there is no bad guy, no villain. In fact, the only thing is the threat that Arthur has of the possibility of one child not getting a Christmas present on Christmas morning. I had never worked with the director, Sarah Smith. To begin with, she was a little confused about what was necessary, was needed for the film, but I gess together we found our path. It was a heck of a lot of fun to do, notably because it’s a kind of animation that is not connected with Shrek. So, it was very liberating and very fun. You can imagine how hard I had to work to make sure this worked in a limited amount of time and to record it in a week at Abbey Road and then mix it in London. But the price at the end of the day was to be a part of a really charming film. I hope people see it. I think it’s a superior film to Flushed Away, and of course, part of the difference it was DreamWorks before and now this is Sony, and I know they were very supportive in the making of this film. AV: How did you approach the film, musically? HGW: The movie was perfect for some thematic material. We see it right away through Arthur’s theme that comes through strongly toward the end of the film. And there is a kind of nostalgic tune for the GrandSanta character who kind of represent the old way to doing things. It just felt slightly incongruous, in the middle of August, outside of my studio in Venice Beach, to hear tubular bells, play bells and things like that! But it was great fun and we had a great trip on it! AV: As you mentioned, there is a traditional approach to Christmas in the movie, as well as a more technological one. HGW: Running through the film, there are two distinct approaches to how the Santa Claus family sees Christmas. One through the eldest son played by Hugh Laurie, that is all about technology, about an overview as opposed to detail. And then, the opposite of that, which is Arthur and his grandfather, who are much more interested in details, and the fact that one child might be left behind. Musically, I was able to reflect that through this very energetic music that’s often driven by loops, custom-developed by me for the purpose, loops that you wouldn’t necessarily expect here. Also, I tried to incorporate instruments that we associate with Christmas into that world as well. I used a kantele, which is a Finnish national instrument, which I used many years ago in The Lion, the Witch and the Wardrobe creating cristaline kind of sounds, which seemed to work really well. Now, when I came to write the music surrounding Arthur and his Grandfather, I used none of the kind of looped, contemporary-tech sounds. This is more nostalgic, a little bit more what you expect for Christmas, organic and quite orchestral. And then, toward the end of the score, toward the end of the movie, these things kind of collide and mix. And, in addition to those two aspects of the score, there’s quite a fun intrusion of NATO, the humans who see what’s going on, and there’s quite a serious music that completes those themes. It’s a bit of a throwback for me – I’m not using too much electronic. It’s very much tune-led, melody-led, theme-led score, utilising a large orchestra and colorful orchestration, I hope. AV: How large was the orchestra? HGW: About 70 or 80 players. A really good size! AV: To you, what are the most rewarding sequences of the film? HGW: The opening sequence with the elves dropping out of the sky to deliver presents on Christmas morning. That’s certainly something that had to be scored extremly tightly for picture and was a great fun to do. And the end of the movie. It was very satisfying to tie up the themes in the last five or six minutes of the film. That was very rewarding! But, as I said, from a general point, I found the full task of scoring Arthur Christmas very positive from begining to end, just because I really love the film! Our deepest thanks to Harry Gregson-Williams and Dan Barry!